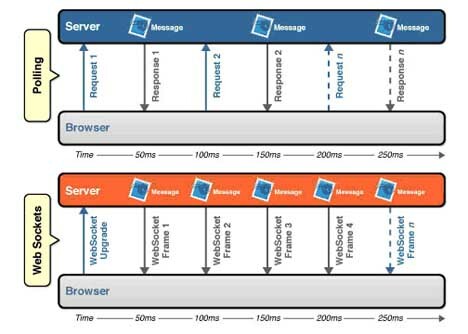 The purpose of this paper is to present WebSocket technology, included in the latest HTML5 specification, which allows much faster communication and dynamic communication server / client. "WebSocket is a technology providing for bi-directional, full-duplex communications channels, over a single Transmission Control Protocol (TCP) socket. It is designed to be implemented in web browsers and web servers, but it can be used by any client or server application." This opens a new way for developments such as financial systems, medical applications or any application requiring real-time connections. All very nice... how is used? But taking advantage that Joomla! Platform gives us the possibility to use the library on the command line, we can to think create our own WebSocket server using the library. To write a WebSocket server developed in PHP and using Joomla! Platform as a structure you need to have special classes and objects using sockets, these objects are not included in the official version of Joomla! Platform, so I created a new library based on work by Andrew Eddie on WebSocket for Joomla! Platform including configuration management and WebSocket server. After this, edit the configuration.php file and put there data access to MySQL server. This article does not attempt to create a component for Joomla, for that there are many good tutorials on the Web. So I will offer to download and test the component finished and ready for use. WebSocket promises to be a good platform for the long-sought 'bidirectional transfer' in the HTTP and HTML that allow the reduction in data transfer and enabling tools to create much faster and dynamic real-time and if we add to this the various features that can implement the Joomla! Platform library the horizon becomes very promising.